Is it cheaper to get married abroad in Rhodes, Cyprus, Sri Lanka or Croatia? These days it’s simply expected that your big day will come with a big bill. Whether that’s a sensible way to spend money at the start of married life is another question, of course, but the fact remains that every year thousands of couples spend an average of £24,000 on getting hitched, according to Brides Magazine. So it’s definitely not cheap and, in the UK at least, you’re not even that likely to get a glorious sunny day to celebrate in. 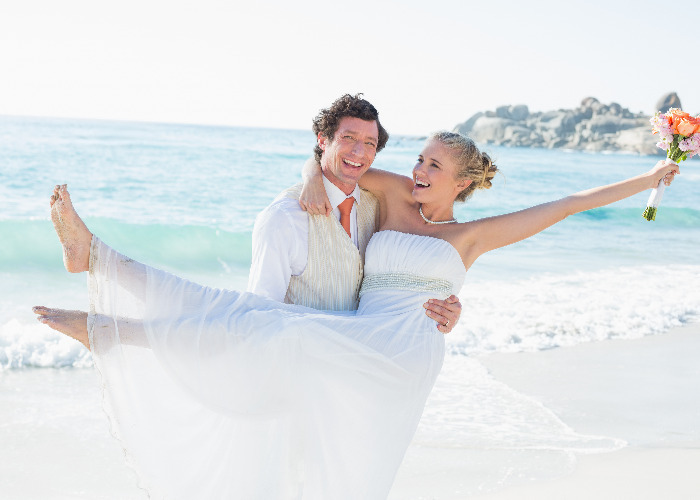 The weather is one reason many couples decide to get married overseas, while many do so in order to keep the cost down. But is it cheaper to get married abroad? We’ve been taking a look. It’s hard to discuss the specific cost of an overseas wedding as there are so many locations, so many resorts and so many different factors. If you want to ride an elephant across a Sri Lankan beach while a choir of girls sing sweet local love songs, for example, it’s going to cost more than the cheapest wedding package holidays where you queue on the beach with other lovers for your turn next to the shared cake. However, the price of a UK wedding is climbing; a quarter of couples have borrowed to fund their big day and almost half of those told the Debt Advisory Centre that they regretted doing so. Melanie Taylor, a spokeswoman for Debt Advisory Centre, says: “As the culture of glamorous celebrity weddings has grown, it’s easy to see why couples feel under pressure to recreate the lavish events they see in magazines. “While celebrities can afford to spend enormous amounts on their dream weddings, for most people this kind of luxury is out of reach and it’s not advisable to get into debt to meet these aspirations. Since it’s also expected that couples will jet off on a dream holiday immediately after buying dinner for everyone they know, it’s undeniable that combining the two and getting a cheaper wedding in the process is a good way to save some serious cash. Ah yes, the downside seems to be reserved for the guests. It’s already expensive to attend a wedding – research from American Express showed that the average guest spends £640 for every wedding they attend, thanks to travel, gifts, hotels and outfit. If you have to add flights to that cost, as well as even longer off work then it’s going to cost your nearest and dearest a pretty penny. In fact, research by LV= shows that an overseas wedding costs guests an average of £1,959! Many guests admitted they had cut back on their own holiday that year, or scrapped it all together. Brexit has not been particularly kind to our currency and many holidaymakers have been dismayed to discover that their pounds won’t buy them many euros or dollars at the moment. However, by choosing the right destination and planning carefully, it’s still possible to save some serious cash compared to the £20-odd grand a UK shindig can cost. So where do people go to get married and how much does it cost? Here are a few of the most popular destinations, along with a bit of information on whether they’d provide the wedding of your dreams or a paperwork nightmare. Warning! You’ll need to research each country yourself before you go, to make sure your circumstances don’t affect your ability to marry there. Don’t elope and then blame us if you come back single! This stunning, historic Greek island is popular with couples from across the world as it’s full of stunning, sunlit chapels, picturesque beaches and romantic restaurants. Wedding arrangements start at £725, but full packages are available for around £5,000. Pros – There are loads of flights to this Greek island and a good range of accommodation for different budgets. Cons – You need to be in the country for a full week before the wedding. It’s referred to as the ‘Island of Love’, although admittedly mostly by companies selling weddings there. But Cyprus is a stunning island to get married in, with beach venues, churches and breath-taking scenery. Wedding packages can cost from £999, while fully inclusive wedding holidays start at £3,599. Pros – You don’t have to be on the island for more than three days before marrying and the paperwork is in English. Also, it’s stunning! Cons – You need a special licence to have a Catholic wedding and any religious ceremony must be preceded by a civil ceremony. This is a good value wedding resort that is also unusual and very special. You can book a range of wedding experiences, including elephants, choirs and more! All-inclusive wedding packages start at just £2,500 per couple, although you can pay as much as you like to enjoy a seriously luxurious stay. Pros – It’s an amazing location and you can travel onto the Maldives very easily with good connecting flights. This is a good value country to get hitched in. Cons – You do need to be in the country for at least five working days before you marry. All these destinations have amazing scenery, but Croatia really is special, with picturesque harbours and historic locations. Full wedding packages for 50+ guests can be arranged for as little as £5,500 for the actual event, so it’s a good-value location as well as a good-looking one. Pros – It’s stunning, it’s picturesque, it’s good value. Cons – You will need to provide all relevant documents 30 days before your wedding, and these documents must be no older than three months on the wedding date itself. If you can forgive all jokes about your wedding being ‘all at sea’, you can marry on a cruise ship and take in lots of different locations. Prices start at £616 on top of the cruise itself, and there is usually an option for day guests to visit the ship for the event. Pros – You’re enjoying a honeymoon and wedding all wrapped into one and can keep the price under control. Cons – It may not feel as easy for guests to join you without booking onto the cruise – meaning they’re there for your honeymoon too! What do you think? Is an overseas wedding is a cheaper choice or should we all just stop spending so much on weddings? Where did you marry? Have your say using the comments below and vote in our polls.